DENVER (BRAIN) — Organizers of the Outdoor Retailer show say the first Summer Market edition to be held in Denver attracted more than 26,000 attendees and nearly 1,400 brands to the Mile High City. FRUITA, Colo. (BRAIN) — Local retailer Over the Edge Sports and the City of Fruita are hosting a three-day meeting here in October devoted to trails-based economic development. DENVER (BRAIN) — Outdoor Retailer Summer Market opened Monday to crowded halls, but suppliers and retailers were worried about the impact of Trump administration tariffs and rising freight costs in the U.S. market. CABDA West is planned for the Del Mar Racetrack. 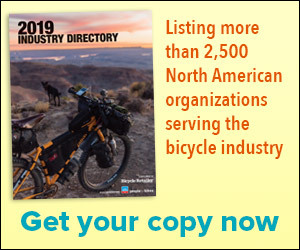 CHICAGO (BRAIN) — After reviving its long-dormant regional trade show in 2015, the Chicagoland Area Bicycle Dealers Association is looking to build on the show's success, adding an event in San Diego in January 2019.